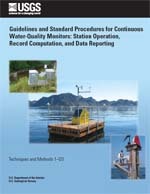 This report provides basic guidelines and procedures for use by U.S. Geological Survey (USGS) personnel in site and water-quality monitor selection, field procedures, calibration of continuous water-quality monitors, record computation and review, and data reporting. Two techniques for servicing continuous monitors are discussed in this report: (1) a method for servicing monitors in a well-mixed, stable, or slowly changing aquatic environment; and (2) a method for servicing monitors in a dynamic, rapidly changing aquatic environment as is commonly found in estuaries. A discussion of alternative methods for servicing monitors also is included. These basic guidelines are minimal requirements that may need to be modified to meet local environmental conditions. Knowledge of the operation of the monitoring equipment and first-hand knowledge of the watershed form the core of the data evaluation process. Record-computation procedures presented in this report provide a uniform set of minimum requirements for computing records. Examples of the application of scientific judgment in the evaluation of data records are discussed and are, by necessity, site specific. Other specific examples also are included to demonstrate the range of environmental conditions that affect the evaluation process.